About a week ago I was laying in bed and thought “wow it’s been a long time since I’ve been in class” and then realized it was almost one full year since I finished school. March 12, 2018 was my last final of undergrad. I think this past year went by in a whirlwind but at the same time it feels like the year was more like 30 months then 12. So much has happened. And I have a whole new life now. The best thing about being done with school is… being done with school. I think having a full time job is way better than when I was in college because there’s a feeling of security and less stress. In school, I often had the stress of not knowing if I would even pass a class even with putting in the most effort I could. And this cycle repeated every…single…quarter for 4 years! Halfway through my first rotation I can say my work environment and responsibilities are nothing like school. I’m not being formally tested and graded on what I remember from a course and feeling like my whole future depended on it. I have gotten the hang of my role and the nervousness can come when I have a presentation coming up or the ambiguity of a new project. Overall I like my job and really like the balance of my personal and work life. I get tired often though, especially around 2pm when I just want to go home and sleep. It’s not really due to me feeling like I’m bored, but at the end of the day it is work lol. The biggest change I’ve had to get used to is simply working full-time. As a student, I worked full-time only for an internship period of 2 months and it was always followed by a study abroad trip. Now, when one week is done the weekend is here and then it ends and I think to myself “alright back to work again…this is what we’re doing now? This is the routine?” With school there are breaks you’re counting down to, you know an end is coming. With work it’s like “hmmm, this is just gonna keep on going and going?” There is no end to it. The breaks in sight come from trips I plan. I have a work culture where I can take vacation days throughout the year and I’m looking forward to a week off next month hooray! Financial security is the biggest change for me that I am blessed to have. I’m able to live comfortably and be able to do things I enjoy like travel and buy essential oils lol. But this one piece, is a huge relief. My tip for future grads is to start acting on your hobbies and interests while in school so it’s easier to build on them once you start working full-time. 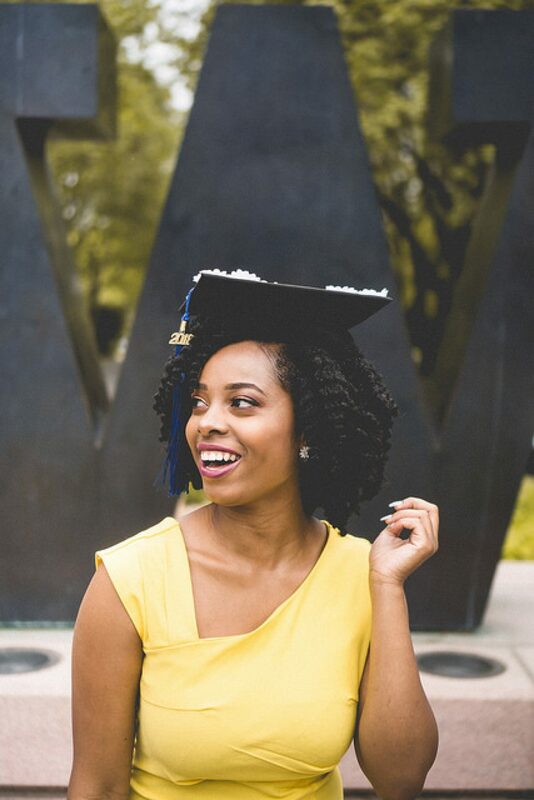 Don’t let being a student define you.Graduating college is the most monumental goal ever and once that’s done you may feel like “now what?” or that you need a new goal. So many years have been riding on accomplishing this ONE thing. That’s probably where my thoughts of uneasiness about routine come from, the “is this my life?” type of thoughts that happen once the weekend ends. Introducing new fun things have helped me these last few months so I don’t feel like it’s just work work work and living for the weekend. Small interesting goals are fun. Being goal-driven can’t just be turned off once you finish college. I try to do activities after work that involve some sort of ambition like going to the gym and taking challenging classes. Launching a new business, Dai of Social, was also no small thing this year. I even had my first branding workshop this week which made me feel so accomplished and happy my client was happy. Staying in touch with friends and making new ones is another aspect of graduating. Yes I do miss having a handful of girlfriends around me that can go with me to on campus events or to go out with. It often does take days or weeks in advance to plan a night out or just to hang out. This can be difficult but it’s just the reality of things when people move away or are in different parts of the city. I’d probably be making more friends if I had moved to a new city and knew absolutely no one. I have a lot of new acquaintances but not necessarily in the friend part yet but making progress with getting to know people and seeing if we vibe well. I don’t force anything. I make an effort to be social but I don’t overextend myself or try to be like anyone else. I of course enjoy my alone time. I explore the areas around me and have gotten quite used to my new neighborhood. I love being able to do what I want to do and when I want to do it. My actions aren’t confined to what finals I have coming up or what topic I need to study more on. I can take a night in and watch tv and the next day can go hang out with a friend. I’ve always been a person that does what feels right with my spirit. So I’ve found a good balance with being social and being by myself. One night I thought to myself ” was college really the most fun I’ll ever have?” There were some nights for the books where everyone would go out to the same place and dance all night. I haven’t had a night like that in a while or as much. Maybe there will be more of that when it gets warmer but that’s one thing that’s been different with life after college, very little functions and going out. I miss the *option* of going to class or being able to not go to work lol. My classes started at 10:30am, and it was up to me if I wanted to go. Now I wake up around 7:20 am every single day and it never feels like I get enough sleep. Last year if I felt I didn’t get enough sleep or I knew I wasn’t going to be in bed on time, I would simply take a “personal day” from class. There’s none of that now and that takes some mental strength to accept that you are an adult and these are real adult responsibilities. I also miss being around black people in spaces and events that were in close proximity. There was the IC at school, for students of color, all of my roommates, the undergrad clubs for business school, and so many functions I could go to when I had the time. Now those are few, far, and between outside of school. I’m finding more events on Facebook for black women now and it just requires a little more effort and research when finding these spaces but I think it’s worth it. I’ve tried a lot of new ideas recently. Now I am at a point where I just want to experience life and be inspired. This year my motto was to be shameless and act on any and every idea I think of. But there’s also beauty and importance of being still. Listening to myself. Living. And enjoying. I think that’s where my next amazing idea or goal will come from. It’s okay to not have a million things on your to do list. And I’ve changed my mind about what interests me and that too is okay. I just want to do what I find interesting and build on those interests. Each chapter in life has lessons and amazing memories that only happen in those chapters. When I think of freshman year, would I want to go back? Absolutely not. It was rough trying to pass my prerequisites but then I can always remember my first spring quarter on campus and the hilarious weeks of events and memories. Same with the rest of the years of college, oh yes it was so much work, but each year had something unique and special. So even now as I’m new into my career and a young adult, there are things I miss and things I’m getting used to, but there’s something special about this chapter too. And I want to be present and enjoy those moments as well.